Thriving Ivory, under jockey Francisco Calderon, winning the $15,000 Sam Houston Distaff on the 2017 closing QH card at Sam Houston racetrack Monday. 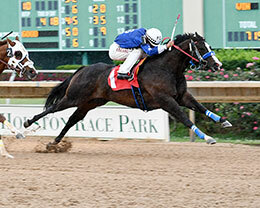 HOUSTON, TX�MAY 22, 2017�Thriving Ivory got her first career stakes win on Sam Houston's 2017 closing Quarter Horse card Monday when she defeated Zoomin N Celebrating by half-a-length in the $15,000 Sam Houston Distaff. Post-time favorite Barefoot Beach finished a nose back in third. Ridden by jockey Francisco Calderon, Thriving Ivory completed the 300 yards in a quick :15.113 clocking while earning 111-speed index into a 10-mph crosswind. Trainer Angel Sanchez saddled the IVORY JAMES 3-year-old to her third win in nine starts for owner Agustin Hernandez. Bred by Bobby Cox, from the First Down Dash mare Shes Dashin First, the brown filly picked up $9,000 to boost her career mark to $127,333. Thriving Ivory was second in last year's TQHA Sale Futurity(RG2) at Retama Park and was a finalist in the Dash For Cash Juvenile and Sam Houston Derby(G3). Leading trainer Judd Kearl saddled runner-up Zoomin N Celebrating for owners Chad and Esmeralda Peck. J. Buchanan, Eller III and S. Pitman bred the Azoom filly in Texas from the Takin On The Cash mare Feefees Celebration. She earned $3,000 for the effort. Another IVORY JAMES filly, the aforementioned Barefoot Beach, lunged at the finish to get up for third. Trained by Kearl, Barefoot Beach races for Samuel Martinez and was ridden by Sam Houston's leading rider Rodrigo Vallejo. Also bred by Bobby Cox, the multiple stakes winner is out of the multiple stakes producer Babe On The Beach by Invisible Injun. Barefoot Beach earned $1,650 to boost her earnings to $92,125. Jess Iam First Royal, Apollitical Girl, Hiclass Ms, Ima Dashing Gator and Wish A Tong completed the field.